On first reflection, I imagine this graphic, found in an atheist Internet community, might strike a chord with some folks. I mean, isn’t the world grossly unfair? Why do some people have so much while some have so little? And why does God just sit on His hands and do nothing about it? These are valid, important questions. I asked them all before becoming a Christian at age 42. Once I decided to follow Jesus Christ (whom serious Christians believe is God’s Son), I thought long and hard about these questions from my new perspective, because I still needed them answered. Some people have a lot and some have very little because of where they live. It’s a lot easier to make a go of it when you’re not struggling to survive drought, typhoons and earthquakes. Now before you blame God for natural “disasters”, ponder the notion that the world’s rich nations could take in far, far more immigrants. In addition, they could work through agencies like the United Nations to move people away from disaster-prone areas. The fact that these things don’t happen isn’t an indictment of God. It’s an indictment of US in the developed world. And it’s an indictment of people who won’t move, no matter how bad life gets. Who says God won’t give them food? Does God give rich people food? Do you really think that’s how the world works? Furthermore, God DOES give hungry people food. That’s what organizations like Samaritan’s Purse, World Vision, Compassion Canada, Feed The Children, Oxfam and many more do. They provide opportunities for you and me to be the hands and feet of God by using our riches to feed people AND help them feed themselves. If you give the Bible any credibility, consider what Jesus tells His followers: “The truth is, anything you refused to do for any of my people here, you refused to do for me” (from a section simply called ‘Matthew’). And please know that Jesus considers ALL people to be worthy of being His. 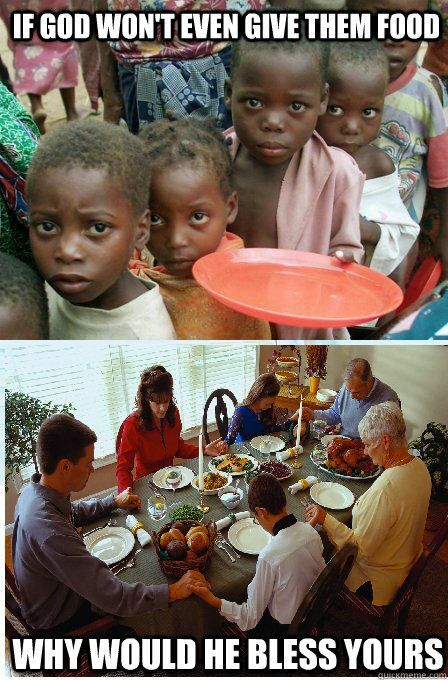 So, are YOU part of what God is doing to help the hungry? Before I decided to follow Jesus, I was not. Now I am. That’s no credit to me; that’s credit to Jesus, who I invited into my life to make me more like Him. There are more results from having Jesus in my life. I’ve become more aware of my many shortcomings and know that through my wife and other Christians, God is working to change me for the better. I’ve become aware that this world is NOT how God wants it to be. Since deciding to follow Jesus, my ugly ego has been reduced enough to realize that I’m part of that problem. I seek forgiveness from the One who I believe is the only valid judge of humanity. And because I follow Jesus, I know that His sacrificial death and resurrection makes up for my “sins”. I receive that forgiveness! Does this sound attractive to you? Yes or no, post your thoughts below and let’s have a conversation. We are most definitely the hands and feet of Jesus. God DOES care for each and every human being, but wants us to do His work here on earth. And, we are all part of the problem when we don’t follow the Lord’s commands. What are YOU doing to help the hungry? Thanks for your comment. If you’re asking the question to me personally, my wife & I are monthly supporters of Samaritan’s Purse Canada (http://www.SamaritansPurse.ca), which has significant food and agriculture programs in several countries.